The following post is sponsored by FitFluential, LLC on behalf of Mizuno. It's funny. 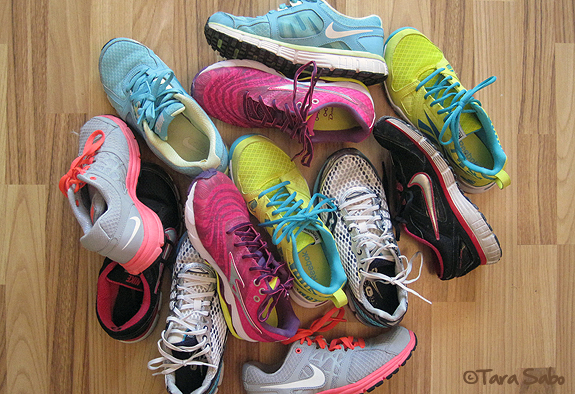 I used to be a one-running-shoe kinda gal. I'd wear them until shoe-death did us part. One single pair would get me through all of my runs, strength sessions and countless other activities. And then I started taking my running game a bit more seriously—and then I got a job in the fitness industry. So now, I take a more-the-merrier type of approach, paying closer attention to wear, tear and shoe type as it relates to activity. Can you spot my newest pair? FitFluential recently partnered with Mizuno to launch their newest running shoe, the Wave Sayonara, and I was chosen to receive a pair in advance of the launch date (July 5, 2013). After training for and running the Chicago Women's Half Marathon, my current pair of running shoes was ready for retirement...or at least a demotion to strength sessions and random gym use. If you've been following follow me on Instagram, you've no doubt seen me in my new kicks. But before you start to think that I'll like any shoe that's given to me, you need to know that I've never been partial to just one brand or price tag. I take a "if the shoe fits" approach. If it fits and if it's comfortable, then I'll make it work! I'm not picky. I like trying new things. 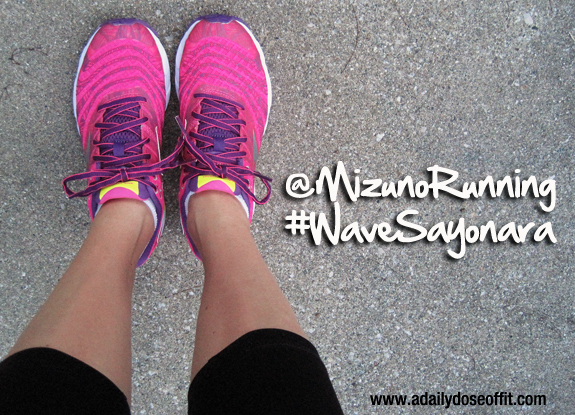 There's more than one great shoe out there, and the Mizuno Wave Sayonara might be one of them. Different, no? It almost looks like there isn't enough tread, but I assure you there is. Traction is definitely present—I run on sandy pathways and not once did I slip. But truth be told, I'm anxious to see how it holds up. Many runners swear by the bottom of their shoes when it comes to knowing when it's time for a new pair. If the tread looks worn down, then undoubtedly the rest of the shoes are worn down, too. Most of my running shoes feature a significantly heavier tread—that's just what I'm used to. 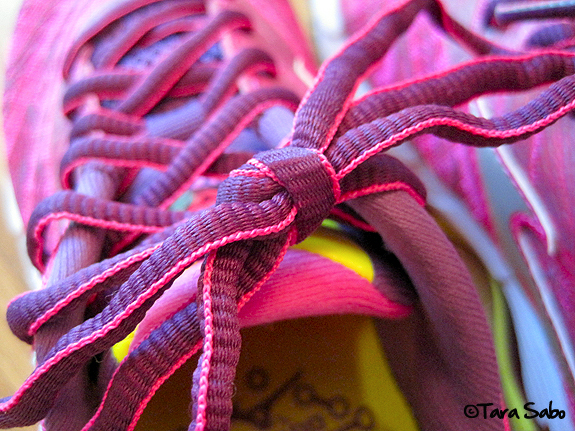 ...laces crossed they stay light and comfortable as my mileage increases. Guys, they're not just for girls. Pavement Runner wrote a great review, so head on over to his site for all the details. Finally, whether or not you run in the Wave Sayonara, another Mizuno shoe, or any other brand of choice—I wish you all the type of run that leaves you feeling light and fast on your feet. That's mezamashii, friends. Wait, woah...what's "mezamashii?" Check it. Question: What is the one feature you look for in a running shoe? 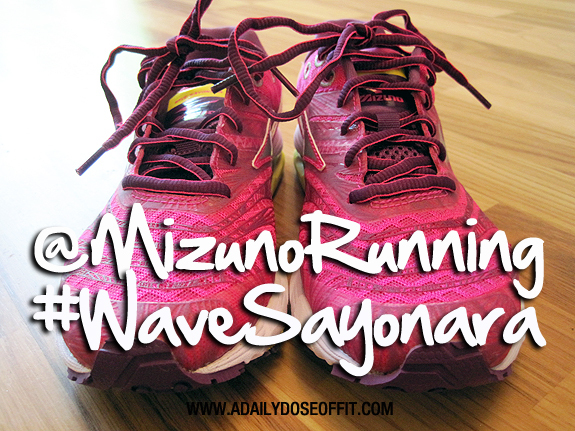 Would you consider purchasing the Wave Sayonara? Why or why not?